Most reputable doctors tend to refrain from diagnosing people they’ve never met or examined. Unfortunately, this circumspection doesn't obtain as often among lay folk. When we lob uninformed diagnoses at other people, we may do those with genuine mental health issues a serious disservice. But what about fictional characters? Can we ascribe mental illnesses to the surreal menagerie, say, in Lewis Carroll’s Alice’s Adventures in Wonderland? It’s almost impossible not to, given the overt themes of madness in the story. Yet we should be careful. Like the supposed drug references in Alice, some of the lay diagnoses now applied to Alice’s characters may be a little far-fetched. Do we really see diagnosable PTSD or Tourette’s? Anxiety Disorder and Narcissistic Personality Disorder? These conditions hadn’t been categorized in Carroll’s day, though their symptoms are nothing new. And yet, experts have long looked to his nonsense fable for its depictions of abnormal psychology. One British psychiatrist didn’t just diagnose Alice, he named a condition after her. In 1955, Dr. John Todd coined the term Alice in Wonderland Syndrome (AIWS) to describe a rare condition in which—write researchers in the Journal of Pediatric Neurosciences—“the sizes of body parts or sizes of external objects are perceived incorrectly.” Among other illnesses, Alice in Wonderland Syndrome may be linked to migraines, which Carroll himself reportedly suffered. We might justifiably assume the Mad Hatter has mercury poisoning, but what other disorders might the text plausibly present? Holly Barker, doctoral candidate in clinical neuroscience at King’s College London, has used her scholarly expertise to identify and describe in detail two other conditions she thinks are evident in Alice. “At several points in the story,” writes Barker, “Alice questions her own identity and feels ‘different’ in some way from when she first awoke.” Seeing in these descriptions the symptoms of Depersonalization Disorder (DPD), Barker describes the condition and its location in the brain. Also highly associated with childhood abuse and trauma, the condition “acts as a sort of defense mechanism, allowing an individual to become disconnected from adverse life events.” Perhaps there is PTSD in Carroll’s text after all, since an estimated 51% of DPD patients also meet those criteria. This “precise description” of prosopagnosia shows how individuals with the condition rely on particularly “discriminating features to tell people apart," since they are unable to distinguish family members and close friends from total strangers. Scholars know that Carroll’s text contains within it several abstract and seemingly absurd mathematical concepts, such as imaginary numbers and projective geometry. 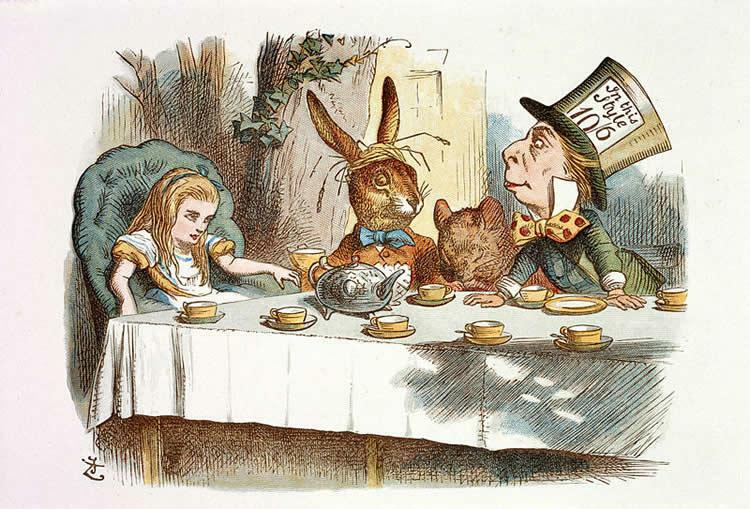 The work of researchers like Kohit and Barker shows that Alice’s Adventures in Wonderland might also present a complex 19th century understanding of mental illness and neurological disorders, conveyed in a superficially silly way, but possibly informed by serious research and observation. Read Barker’s article in full here to learn more about the conditions she diagnoses. Let us not forget that Carroll suffered himself from a disorder that is covered under the heading philias in the DSM manual, I am referring to his notorius pedophilia. A common feature of hypnagogic hallucinations is that parts of your body can change size – so ,for example , your hands can feel very large – or your head very small . This might be part of ” the drink me ” potion whre Alice experiences huge changes in dimensions and then becomes aware of it’s disadvantages and tries to return to ” normal ” size.